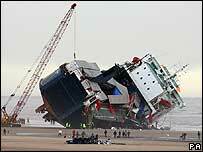 Salvors have started removing oil from fuel tanks of the stricken Riverdance ferry which ran aground at Blackpool. The oil is being discharged from holes drilled into the hull, before being taken away in a tanker. Salvors have also been repairing damage to the hull which should stop water getting in and help efforts to stabilise the ship, HM Coastguard said. A spokesman repeated warnings for people to stay out of the 400m exclusion zone while the work is done. The Riverdance had been heading from Warrenpoint, County Down, to Heysham, Lancashire, when she was hit by a freak wave. Twenty-three people were lifted to safety, including 19 crew and four passengers, on 31 January. Monitoring equipment has been placed around the ship, which is listing at about 60 degrees, to provide information on her stability. After the fuel is removed, salvors hope to stabilise the vessel and control her list before beginning the refloating operation. A spokesman for the Maritime and Coastguard Agency said the operation was proving "extremely difficult and dangerous" because of the vessel's list. Hugh Shaw, Secretary of State's Representative for Maritime Intervention and Salvage (SOSREP), said he was happy with the progress of removing the oil. "An exclusion zone is still in place around the vessel and I would ask members of the public to respect this regulation as it is in the interests of public safety," he said. "Anyone breaching the zone will face prosecution. "Salvors are working in extremely difficult conditions and I would ask that people give them the space they need to bring the operation to a successful conclusion." The Riverdance is beached at Cleveleys, Blackpool, and has proved a popular attraction for onlookers. The operation to remove her fuel oil is expected to take five days.